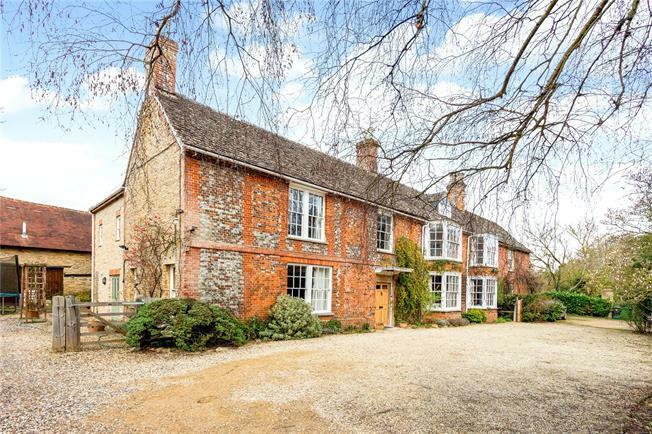 6 Bedroom House For Sale in Faringdon for Offers in excess of £900,000. A Grade II Listed former Georgian farmhouse, and now a beautiful family home believed to date back to c.1740 – 1750 with an array of character features so indicative of a property of this period. These features include high ceilings, sash windows, fireplaces, wood burning stoves and flag stone floors. The flexible living accommodation, in total measuring approximately 4864 square feet and is arranged over three floors which incorporates a separate wing, ideal for a live in nanny or additional family members. The main house has an elegant entrance hall, with three principle reception rooms, including a dining room, sitting room and drawing room. There is a spacious kitchen breakfast room with electric Aga, integral larder, a laundry/boot room, utility room, and rear lobby with access to the cellar as well as a cloakroom which completes the ground floor accommodation. To the first and second floors there are four bedrooms, two bathrooms and ample attic space. In addition and accessed via a separate staircase via the wing the first floor consists a bedroom and bathroom and to the second floor there is a further bedroom and additional attic space. Buckland is surrounded by attractive countryside and The Ridgeway and provides a church, the renowned Lamb public house and an excellent primary school. A wide range of State and Private schools are nearby and include Cothill, Radley College, Abingdon School, St Helens & St Katherines, St Edward’s, Magdalen College, Oxford High and Headington. A wide range of shopping is found at nearby Faringdon and also at Abingdon, Wantage, Witney and the historic City of Oxford with a regular bus service into Oxford on the A420.